15% reduction in installed interior lighting power density (watts/square feet) below the code standard. 84% of all construction and demolition waste was diverted from landfills. 56% of the total material value consists of products manufactured locally. In support of Harvard’s goal of reducing greenhouse gas emissions 30% below 2006 levels by 2016, inclusive of growth, Harvard University’s School of Engineering and Applied Sciences (SEAS) and the project team were committed to sustainability from the onset of the Computing and Information Technology (IT) Office renovation. This dedication ultimately allowed the project to achieve a LEED Gold Certification under the LEED for Commercial Interiors (LEED-CI) version 2.0 rating system, making it Harvard’s 38th LEED Certified project. SEAS IT supports the School’s research, administrative and teaching communities by installing and maintaining effective technology through the provision of numerous measures, such as: providing a stable Computing Infrastructure and support for teaching, learning and research; maintaining operational efficiency; managing communication and messaging; and managing fiscal controls and appropriate resource allocations. The renovation converted 2,003 sq. 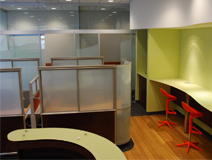 ft. of lounge space into office spaces to accommodate the IT staff and services. The offices are on the ground and second floors of the 97,500 square foot Maxwell Dworkin building at 33 Oxford Street in Cambridge, MA. Completed in March 2009, the main program elements included 5 private offices and 3 open office areas divided between three locations (G107, G121 and 211). The scope of the renovation included new furnishings, lighting, windows, millwork, electrical, tel-data, and audio visual (AV) system. Harvard’s Green Building Guidelines and the LEED-CI rating system played an important role, such as guiding the selection of more sustainable materials and the mechanical, electrical and plumbing (MEP) systems for the project.